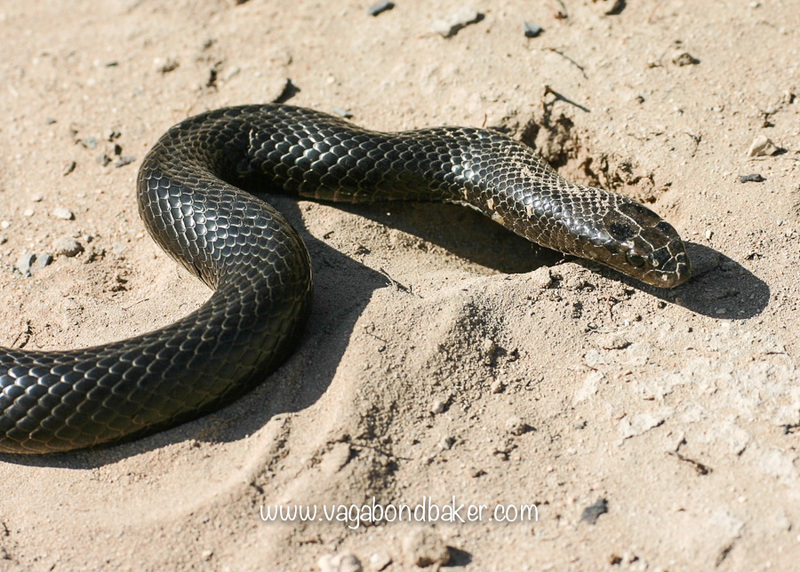 In this last stretch of our adventure around half of Australia we loose our tent in a storm (while we’re still in it), head inland to the incredible Flinders Ranges, a snake launches itself at me (!) 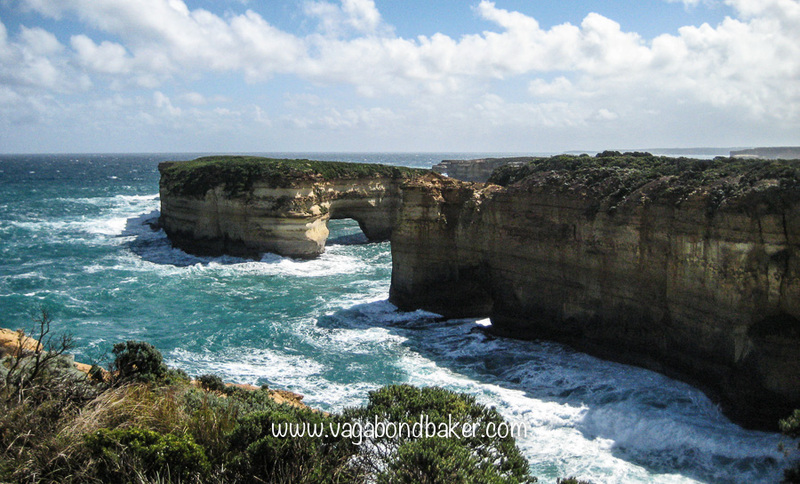 and we drive the Great Ocean Road to the end of our road trip in Melbourne. 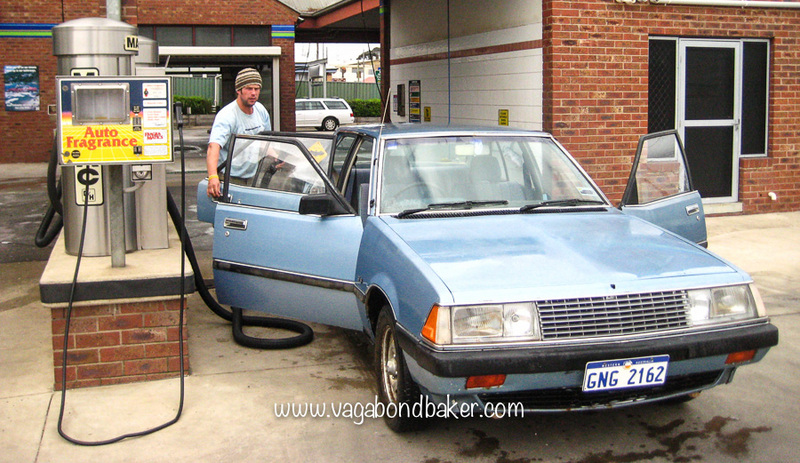 Chad was going strong, we had 2000 kilometres left to drive and it would take us 19 days. 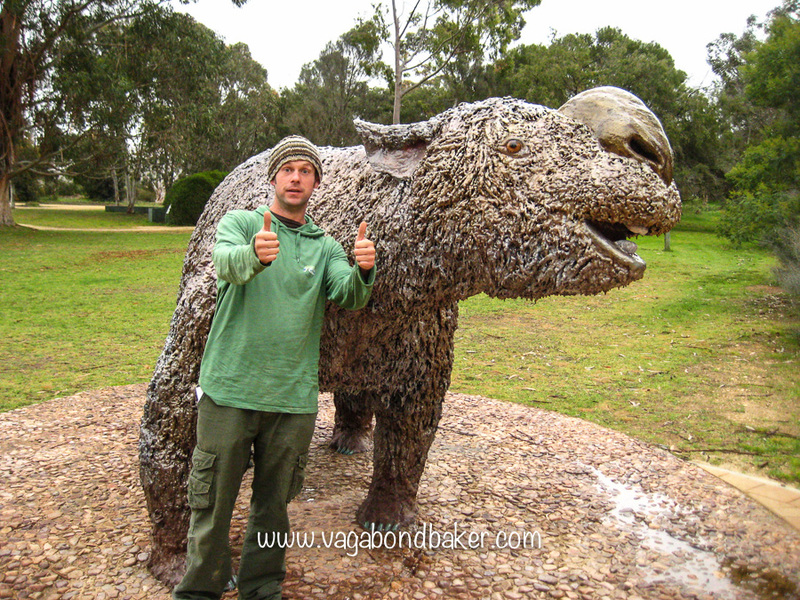 The previous post in this series had seen us arrive into Ceduna after crossing the Nullarbor plain, we didn’t stay here though, instead we got some wild camping tips from the Tourist Info and headed down onto the Eyre Peninsula. 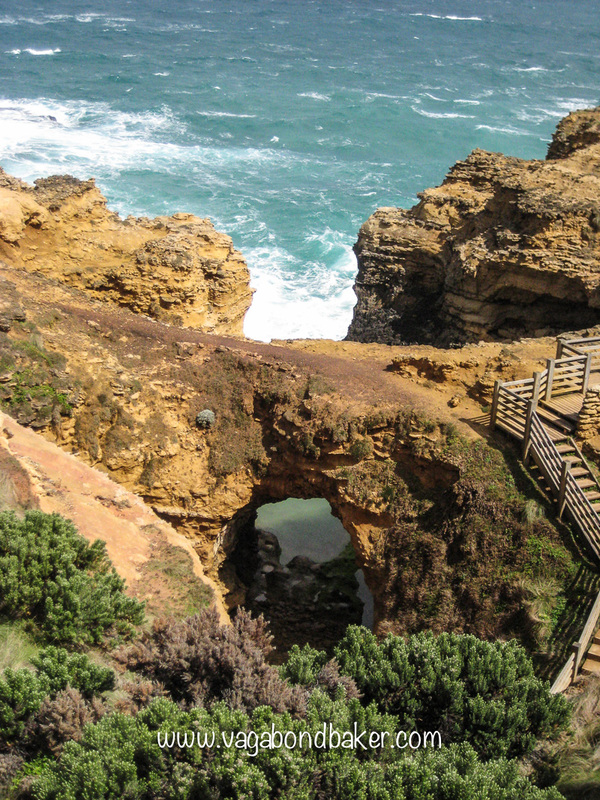 The Eyre Peninsula is a fat triangle of land pointing out wildly into the ocean between the Nullarbor and Adelaide, it’s famed for seafood and sea life: you can cage dive with sharks here, or swim with sea lions. 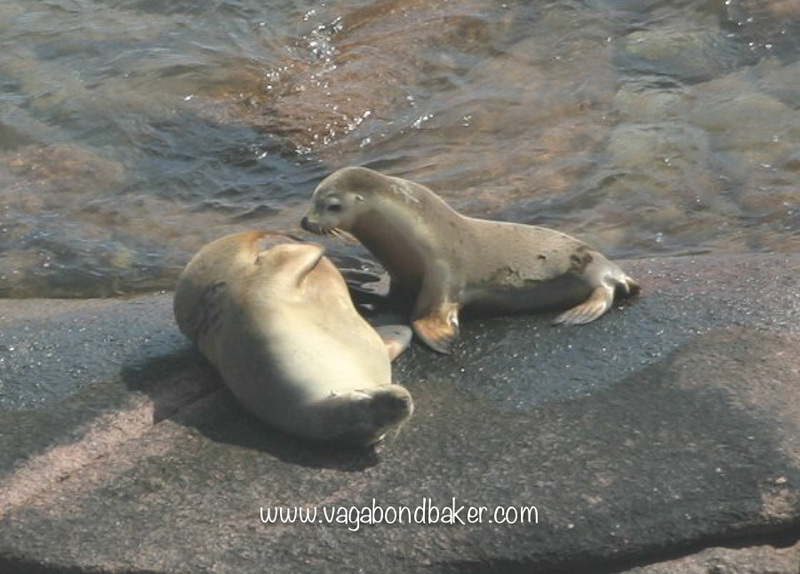 The weather turned wild overnight and we never took to the water, we did see the sea lions though, from Point Labatt. 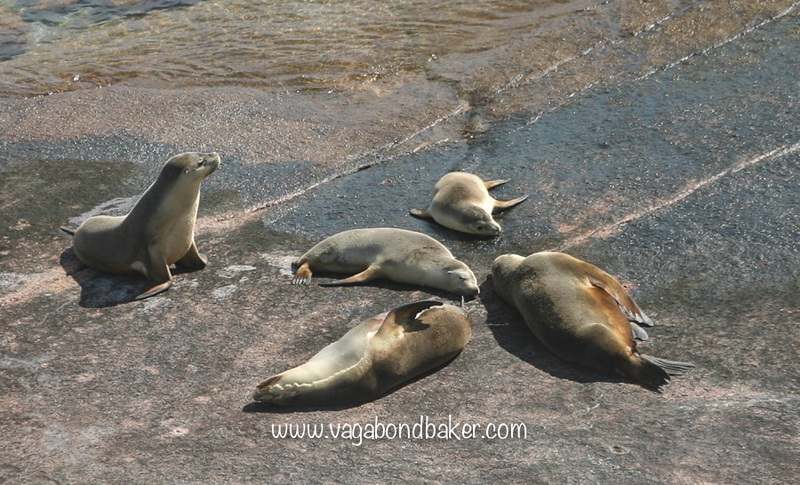 From the viewpoint we could see the sea lions on the rocks below: big gruff males and suckling pups. There was creche, a large male kept watch for danger while five small babies dozed in the sunshine. 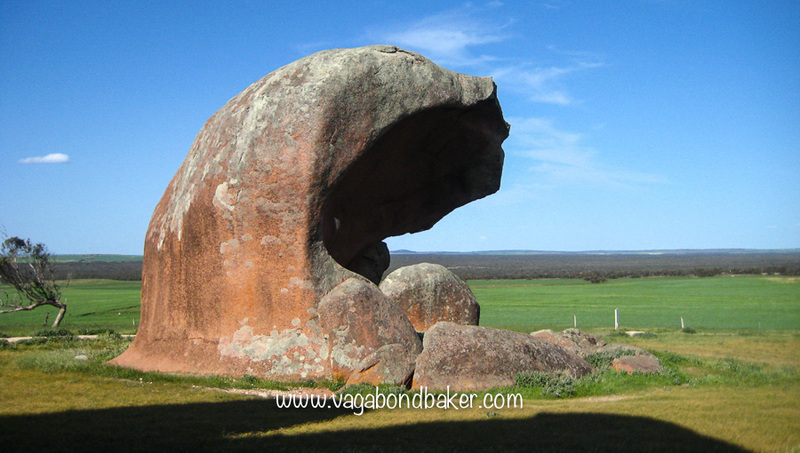 We had tracked the coast down to Streaky Bay and after watching the sea lions we drove to Murphy’s Haystacks. These strange rocks look like massive mushrooms and the closer you get to them the bigger they appear, they made a quirky stop on our way to the recommended wild camp site. Following the dirt road down to Talia Caves we came to a beach, huge white sand dunes crowned the beach and the track lead to a parking area among the dunes. It was late in the day so we pitched our little red tent in the soft white sand in the shelter of the dunes and I made a feta and pea fritatta for tea. The sun hung low and it was a beautiful end to the day; I took a wander up to the ridge of one of the dunes, it was so lovely and the site felt magical. There were quite a few mozzies about so we sat in the car and read as darkness fell. A shooting star flashed through the night sky. 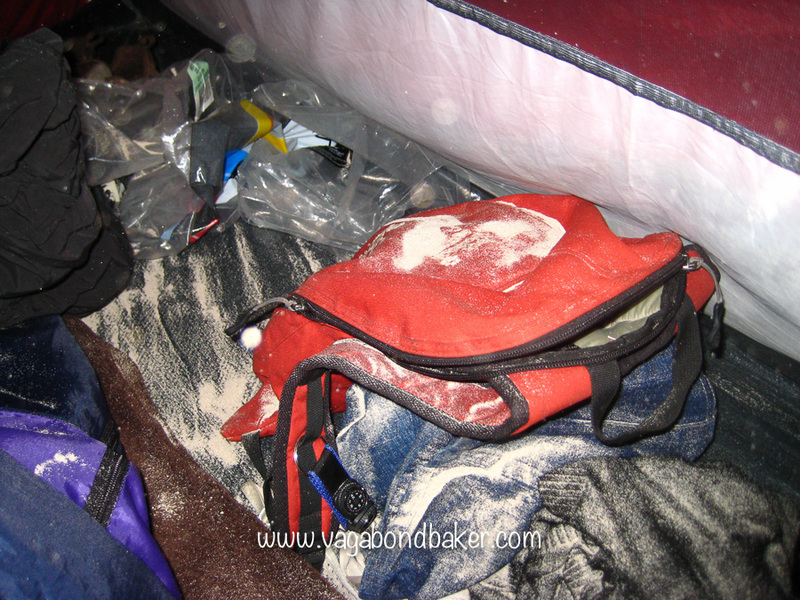 As I lay in my sleeping bag trying to sleep I was aware of the wind picking up. 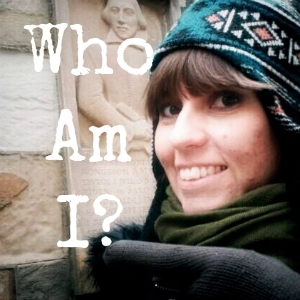 It began to whip the tent, blowing sand through the gauze, covering everything. Then the rain came lashing the thin canvas and the wind buckled the tent, folding it in on itself. It was impossible to sleep. It was 4 am. Admitting defeat we bundled everything we had and made for the car. Moments later the tent collapsed so we fought with the wind to take it down as best we could and took shelter in the car. Sunrise eventually came, we drove back up the track to have a look at one of the caves. The wind was still wild and the sea raged giving drama to the rough coastal scene, and blew the cobwebs from our sleep-deprived heads. Deciding to leave the coast behind we decided to cross the peninsula to Kimba, but after a while on the road neither of us could keep our eyes open so we pulled over onto a rest area and slept for a few hours! 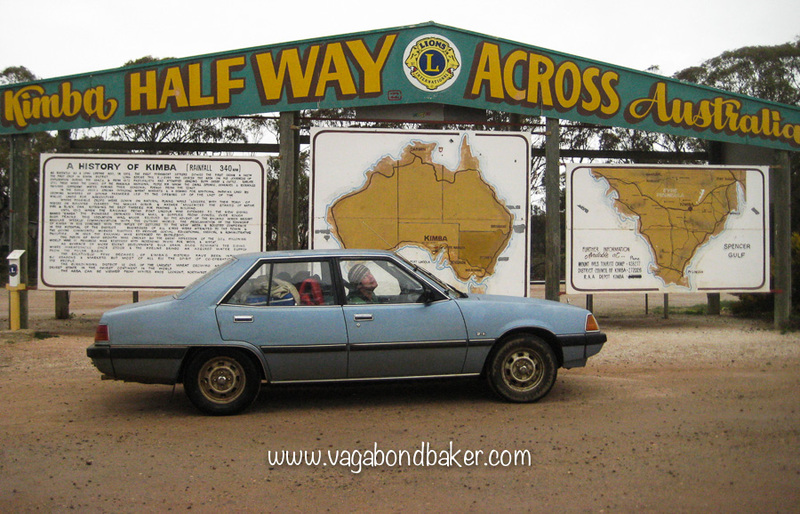 Kimba is half way across Australia. Yes, half way! 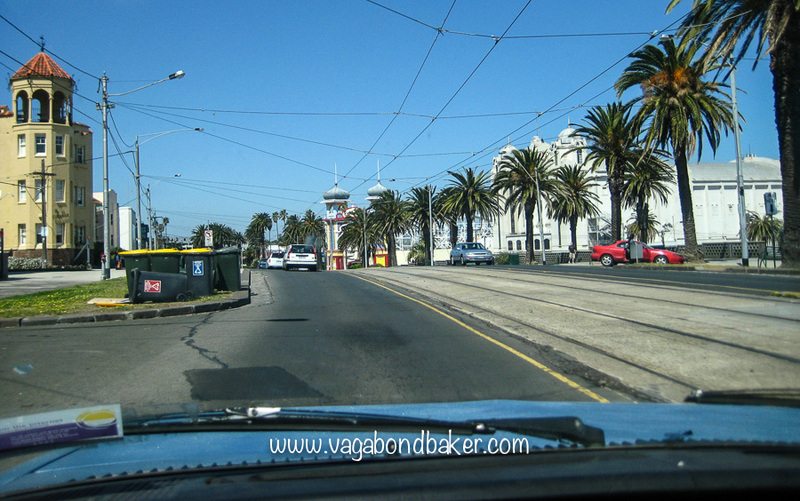 It feels strange that this is the last post yet we were only half way, yet we weren’t driving to the far right side of this huge country, only as far as Melbourne in southern Victoria. 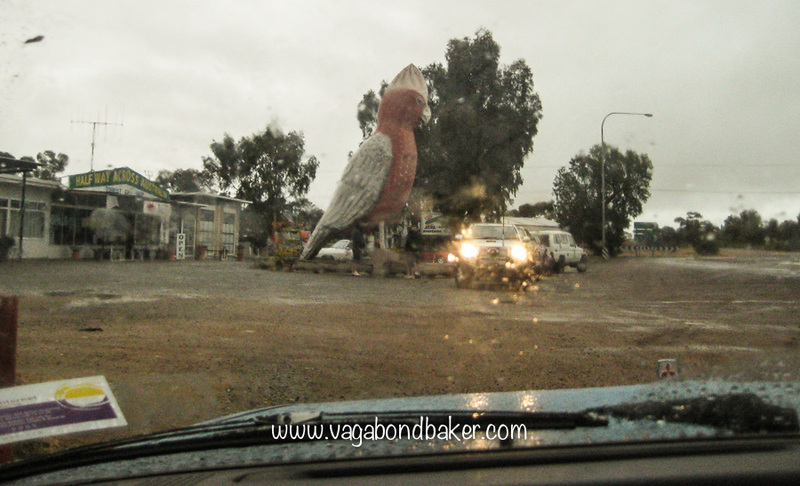 There is a Big Galah in Kimba, this huge pink cockatoo peered at us through the driving rain, it was too wet for a proper photograph – I’d already got wet photographing Chad at the Half Way sign! 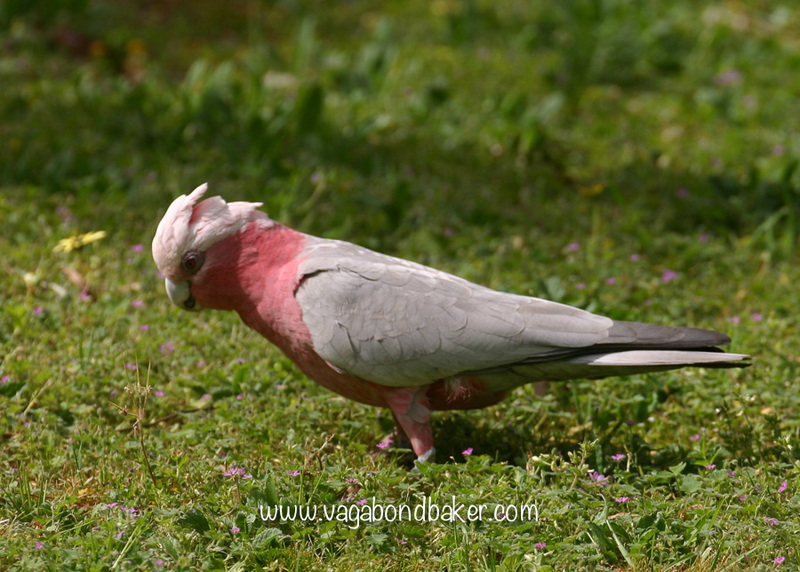 The bad night, the ruined tent, the rain: this was not the best of travel days and it got worse as a real galah flew into our windscreen as we were driving with an explosion of pink feathers. To make up for this calamitous series of events we pitched up our broken tent at a caravan park in Port Augusta and went for a delicious and well deserved Indian meal in the town: saag aloo makes everything better. The tent had seen much better days so we ditched it and treated ourselves to a new one: this one even had a porch area, it was positively palatial compared to our old red tent! 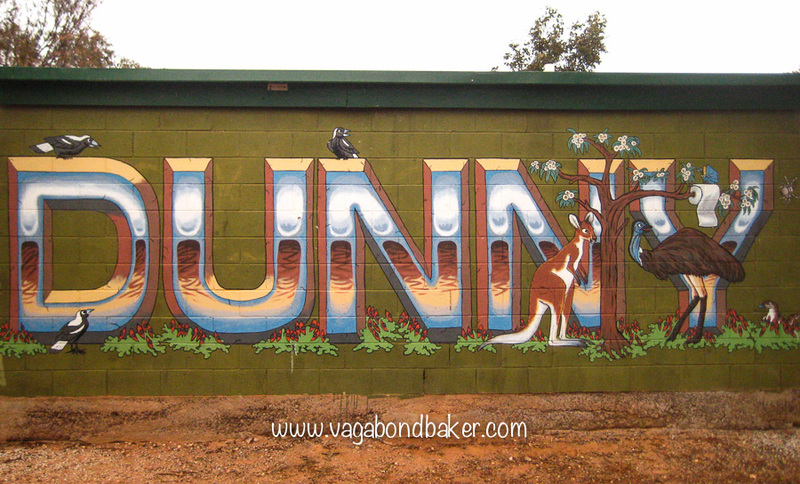 We drove north, through Quorn – a really pretty little town on the old Ghan railway line – and the friendly guy in the tourist info gave us details of a nearby free camp and leaflets for the Flinders Ranges National Park. A trail left the campsite through the gorge then lead up for wonderful views from numerous look outs. 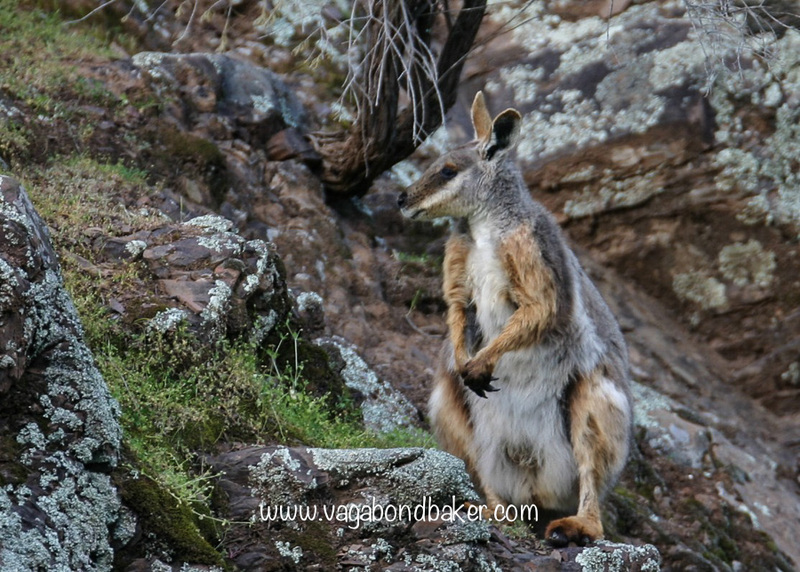 Warrens Gorge is an absolute gem and there are Yellow Footed Rock Wallabies living in the gorge. We sat and read in the car as night fell and a beautiful fox strolled into our camp area – red foxes are very much considered vermin here, introduced in the 1800s they have a huge negative impact on native Australian wildlife. This particular individual seemed very interested in the empty pan I’d used to heat milk in, Chris had to shoo him away! 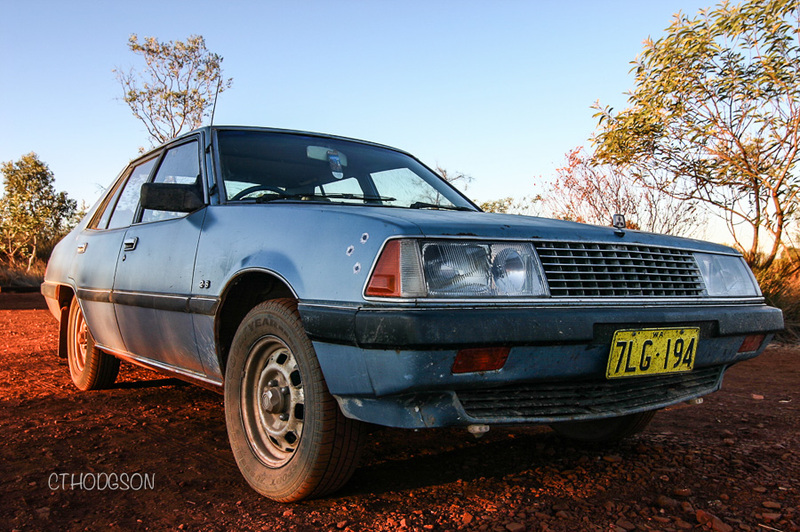 Next morning was a chilly 9ºC and Chad did not want to start, he is a warm weather fiend! 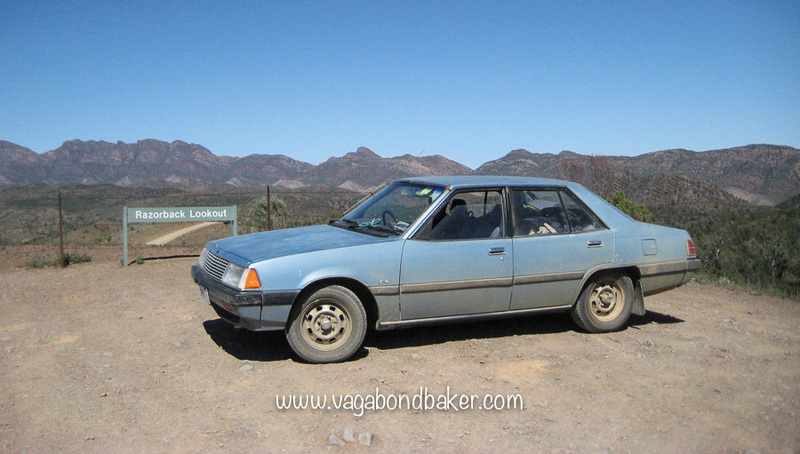 Eventually he fired up and we set off to the Flinders Ranges. 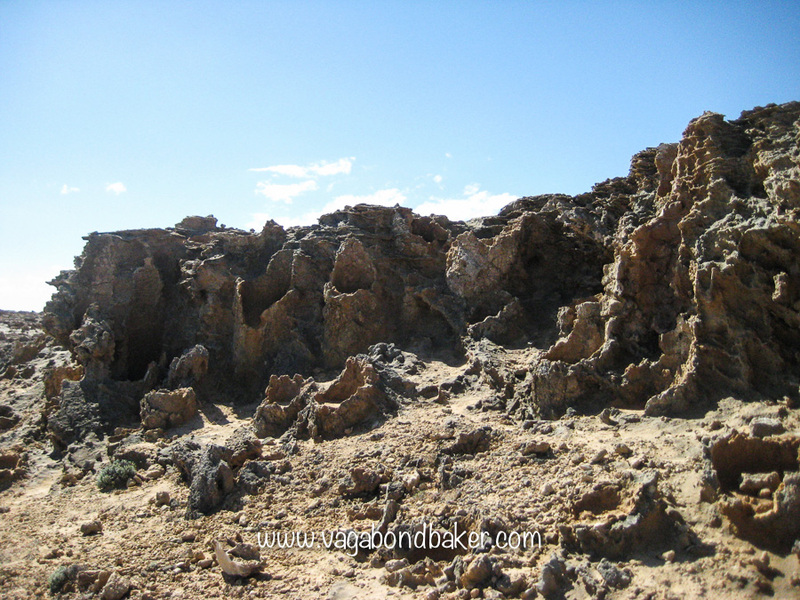 En route we stopped at the curious rock formation at Death Rock: it looks like gnarled face in profile. Then further along at Yourambulla Caves. 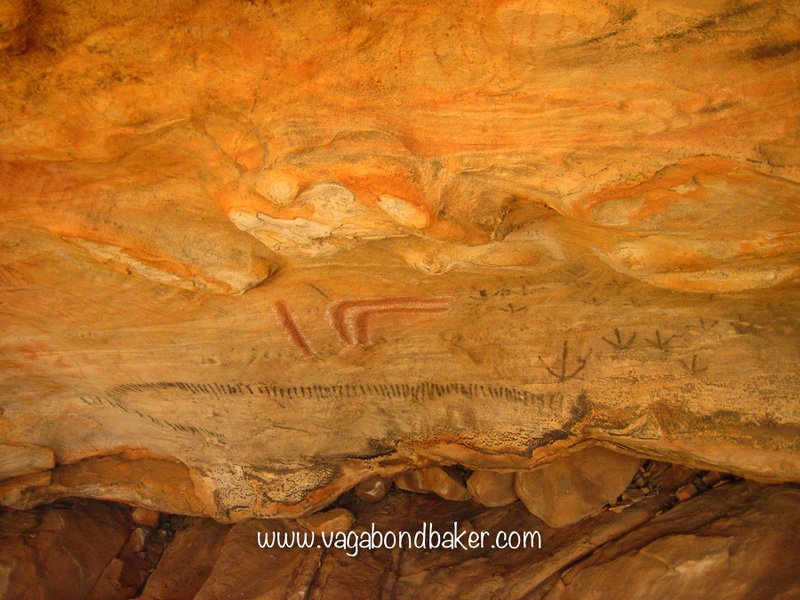 It was a good hike up to the first cave where –behind a caged screen – we could see some fine examples of Aboriginal art. 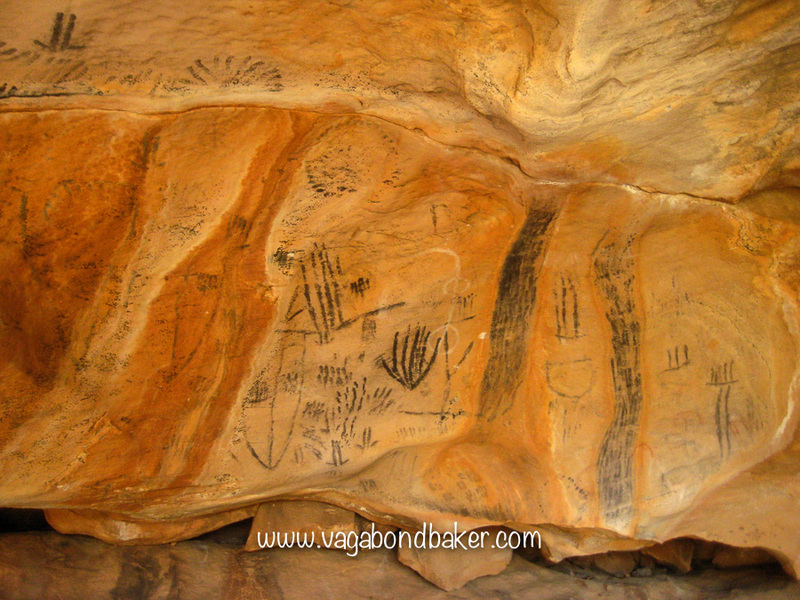 These paintings were done by the Adnyamathanha people over the generations, no one is sure quite how old they are. 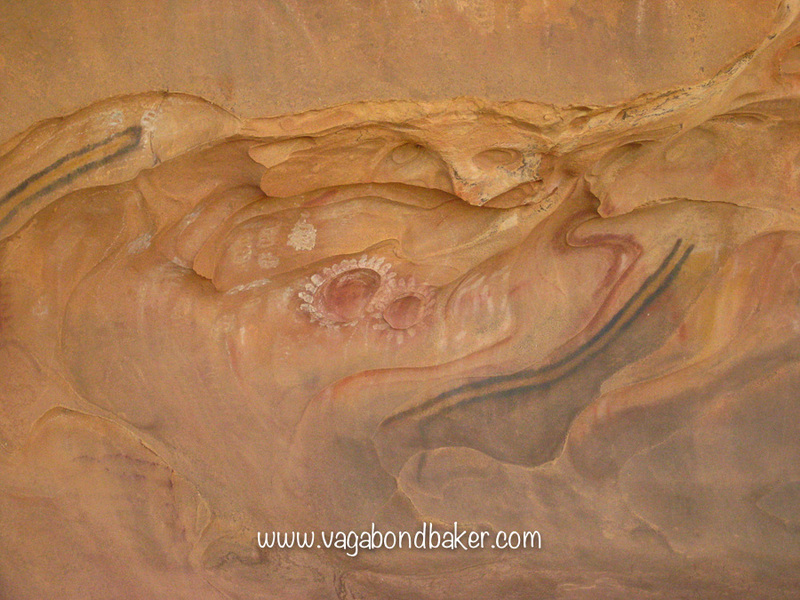 It was a stiff climb up to the next cave where the paintings had colour and a sprayed hand. 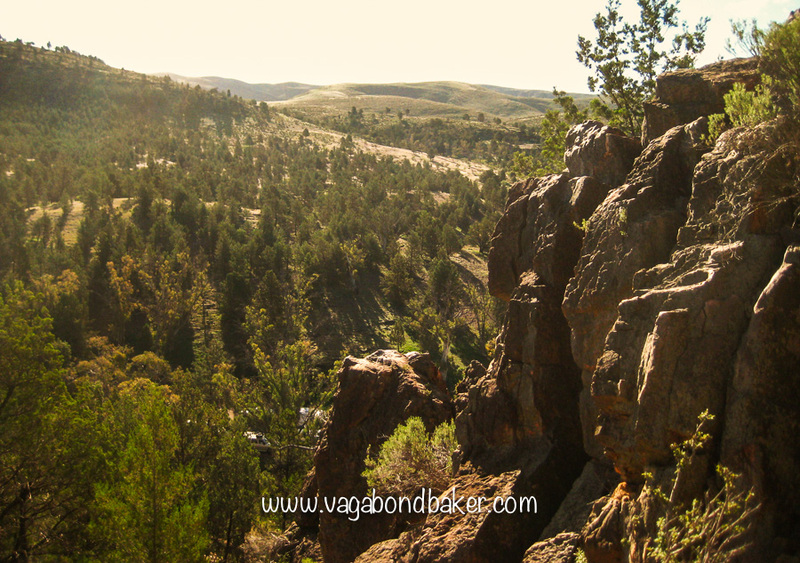 The caves are situated at a high elevation with magnificent views over the landscape. 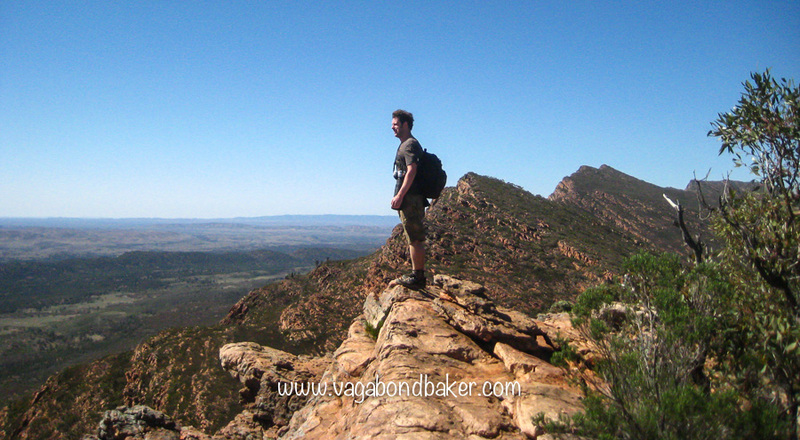 The Flinders Rangers are a huge and spectacular mountain range and at its heart is the vast natural amphitheatre of Wilpena Pound. 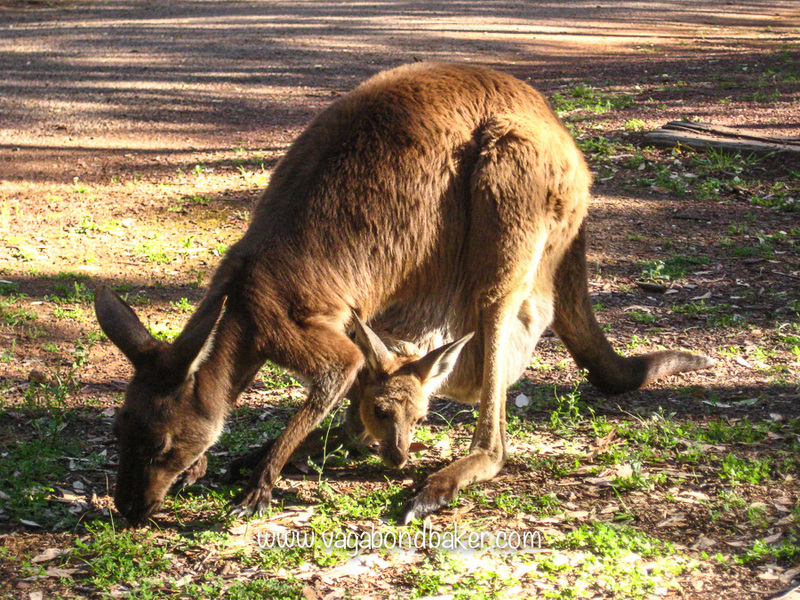 We camped at the Wilpena Pound Caravan and Campground and not long after we’d got our tent pitched a kangaroo hopped over, a big joey hanging out of her bulging pouch, it looked most uncomfortable! He popped out for a few minutes to graze and it seemed unbelievable that he fitted in his mum’s pouch but he soon folded himself back in there. 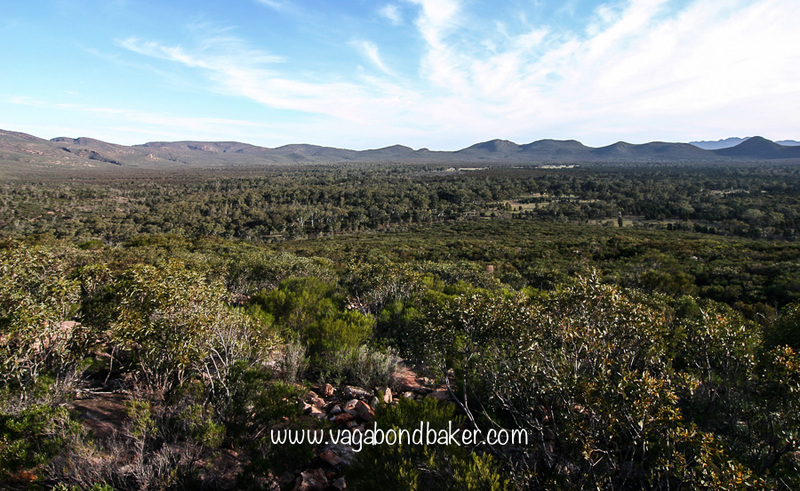 The campsite is on the edge of Wilpena Pound and we took a trail from the campsite to Wangara lookout which gave us dramatic views of the vast interior of the Pound. Next day we did a hike up to the summit of Mount Ohlssen Bagge from the visitor centre. I found it quite hard work and tiring but it was well worth it. 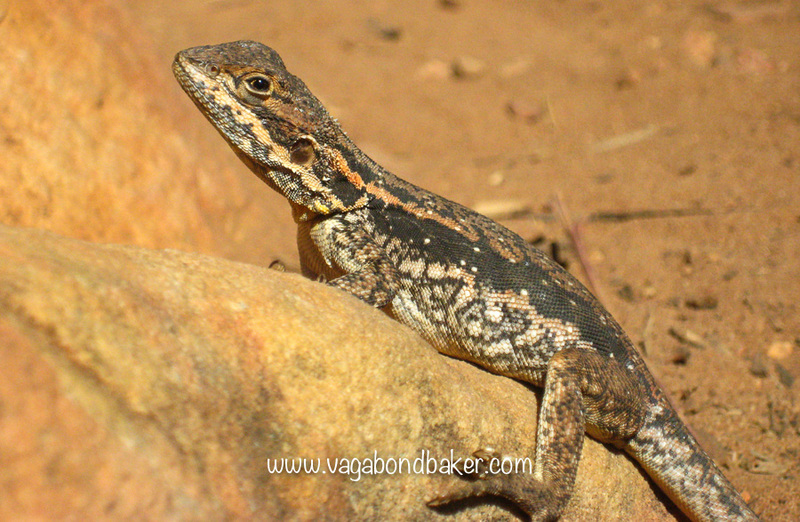 The red rocks were alive with many different kinds of lizard and the views from the top over Wilpena Pound were better than we’d had from the lookout the previous afternoon. 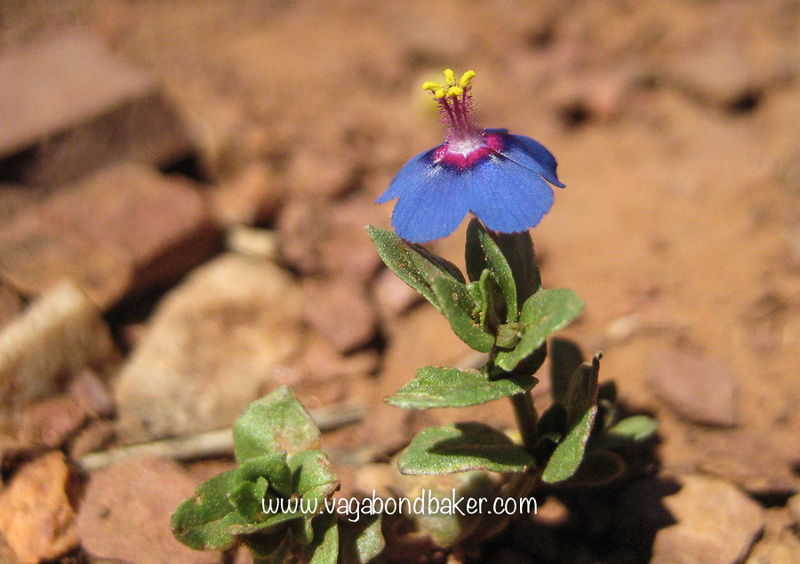 The trail linked with another called the Drought Busters Walk where we saw lots of tiny flowers, so colourful and delicate in such an inhospitable dry environment. 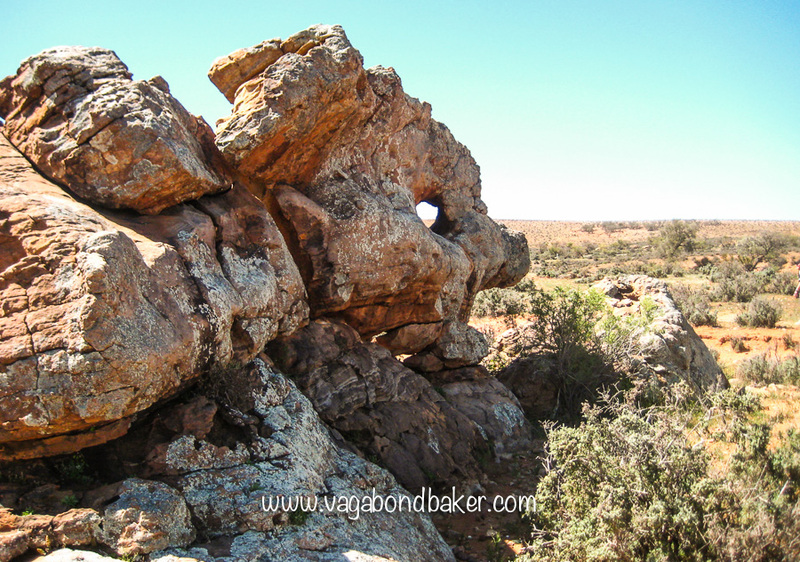 After packing up the tent the next morning we drove to a couple of interesting lookouts and saw some more fabulous Aboriginal artwork at Arkaroo Rock after a hot three km hike. 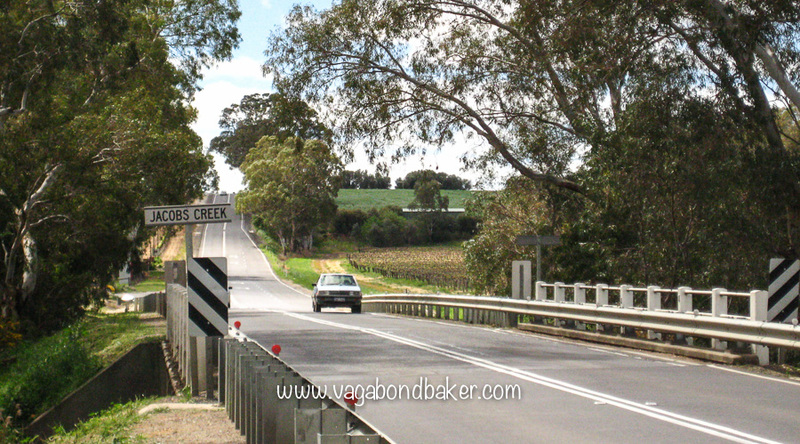 After overnighting at a campsite in Port Augusta we headed to Adelaide the following day however on the way we changed out minds and turned off to the nearby Barossa Valley where I experienced great satisfaction when we drove over the actual Jacob’s Creek. Fields and fields of neat vineyards stretched out over the landscape, vines hanging off the wires, as we drove to attractive Tanunda where we camped for the night. This smart little town at the heart of Barossa has some great shops, the bookstore even has a dog-eared stuffed Tasmanian Tiger, a sadly extinct native species. We couldn’t leave the valley without trying any wine so we went to the Jacob’s Creek visitor Centre and tasted a few! 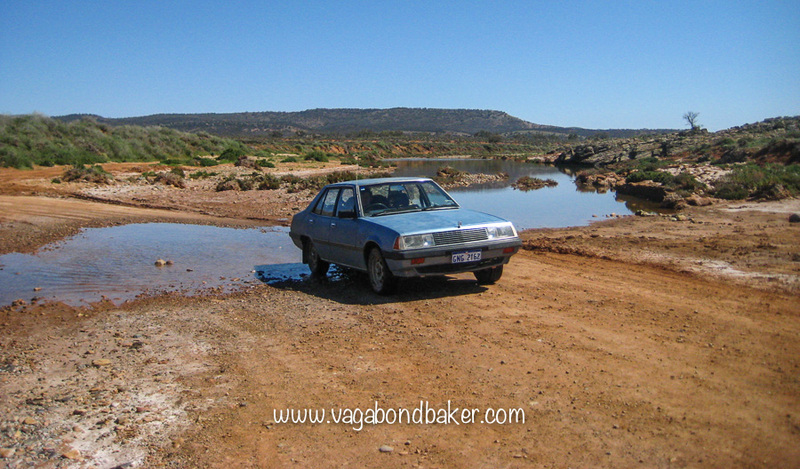 A twisty winding road took us into Adelaide where we camped at the leafy Brownhill Creek Caravan Park. We spent three days in Adelaide, largely because I’d applied for a New Zealand working visa and I needed to get a chest X-ray to apply. I thought this might take up a big chunk of time but it was all very straight forward. Adelaide’s Migration Museum is definitely worth a visit, a well presented and informative museum which is very Chris child friendly. It left me pondering the movement of people for the rest of the day. The State Art Gallery more than satisfied the art lover in me and the Adelaide Museum had some excellent Aboriginal displays. We stocked up on stuff – I even found a tiny Lush where I could get a new solid shampoo –, ate cheap food in the shopping malls and went to the cinema. Before we checked out of the campsite we took a walk along the creek at the back, the parkland was lovely: green, leafy and awash with wild flowers. We were on the lookout for koalas and we smelt them before we spotted them! Their musky urine smell drew us to a little huddle of eight, eyeing us up dozily from the trees. Early on in our road trip we’d picked up a copy of Sue Grafton’s B is for Burglar which we both devoured and left us hungry for more, we’d managed to find A is for Alibi then a whole bunch of them after scouring every campsite bookshelf, op shop and bookstall. It had become a bit of a fun treasure hunt and took us to shops we may never have gone into otherwise: we had to read them in order! This was all fine and good except we couldn’t find D (is for Deadbeat). We had a stack of paperbacks waiting to be read but a key book was missing, it was most frustrating! Weeks had gone by with no luck. Leaving Adelaide we stopped for lunch at Meningie where – and you can’t imagine our glee – we found the aforementioned book. D is for Deadbeat, finally! 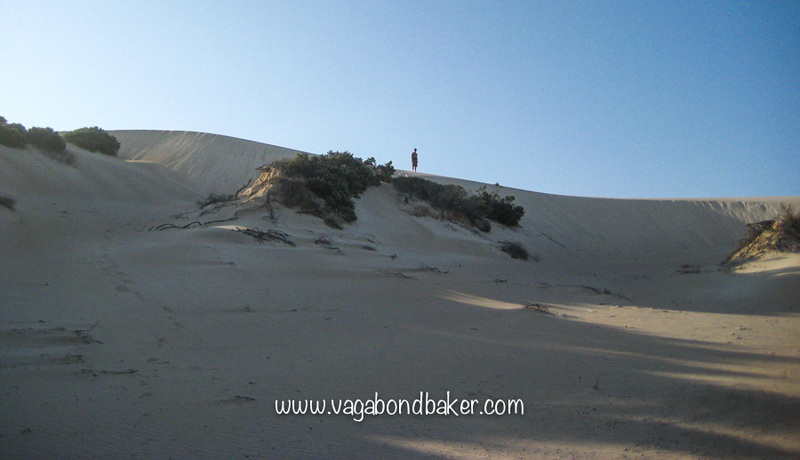 We camped the night at 42 Mile Crossing in Coorong National Park. It was a cold clear night so Chris lit a fire and we toasted crumpets in the embers, under the stars. Rain greeted us in the morning and followed us to Naracoorte Caves National Park where we set up camp then booked the evening Bat Cave Tour! The tour involved watching a live feed of the inside of one of the caves while our young guide told us all about the bats that were flitting around the cave on the TV screen. They are Southern Bentwinged bats – a threatened species – and they only have two nesting places in the world, this being one of them. 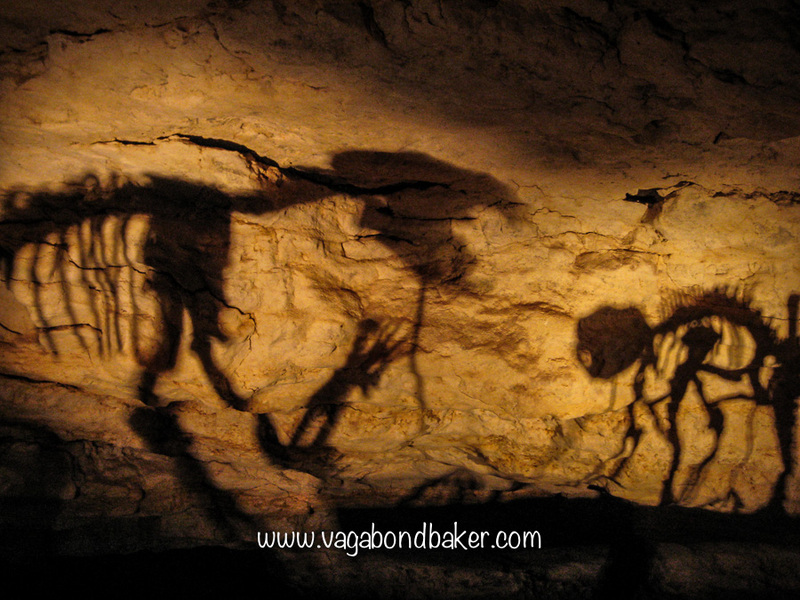 We watched the screen mesmerised as a little bat lapped water from the end of a stalagmite and learnt that they circle the cave in a clockwise direction because this is the southern hemisphere, in the northern hemisphere they would circle anti-clockwise! There were a lot of people on the tour and we now all walked outside to the mouth of the cave: a flat gaping mouth protected by a metal fence that we stood behind lest we tumble in! It was still light and we had to wait for darkness to fall, then slowly, a couple of bats appeared. 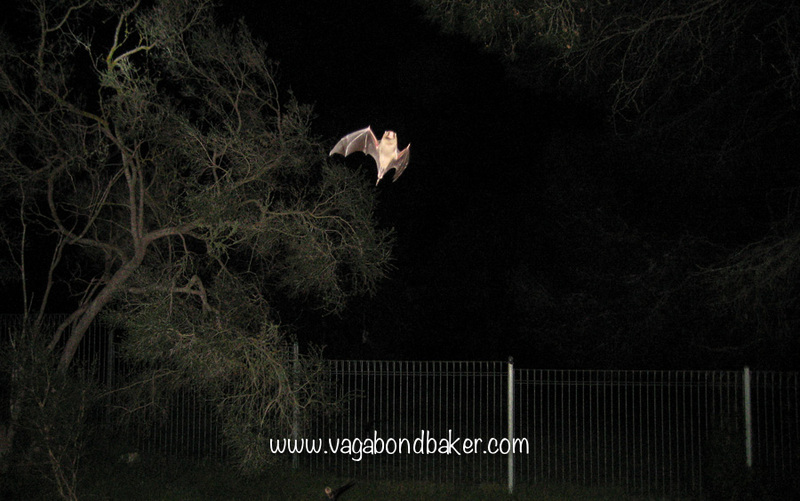 Soon a steady stream of bats were leaving the cave, we could see them circling the cave mouth before they left. While we were watching a possum came out of the cave, climbing up from the depths on a rope. 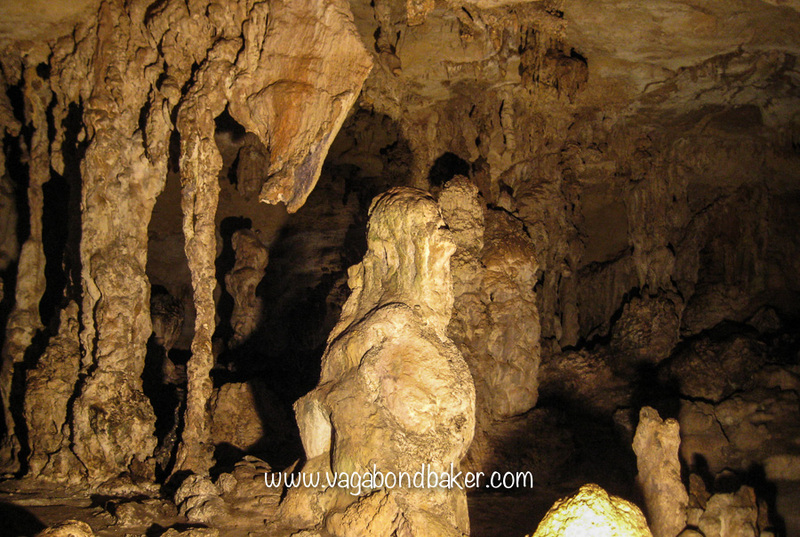 Once the bats had all left for the night we then were taken into Blanche cave for a little tour to see the stalagmites and stalactites. It had open roofs and a Victorian garden within it. 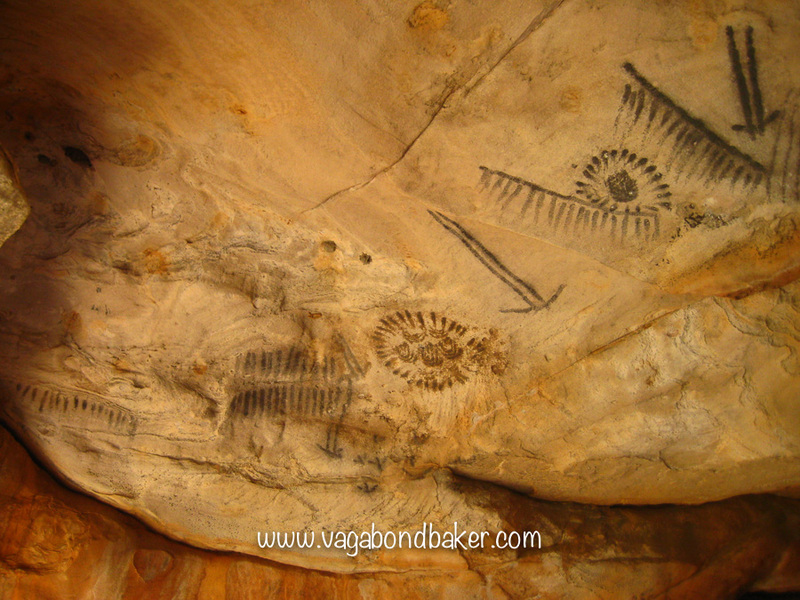 Next morning we took the Victoria Fossil Cave tour, following a guide though beautiful decoration chambers to an area where there was a huge fossil deposit going back some 200,000 years. It had been created by a series of trapdoor holes that had opened and closed over the millennia, unfortunate animals had regularly fallen in and their bones remain to this day. 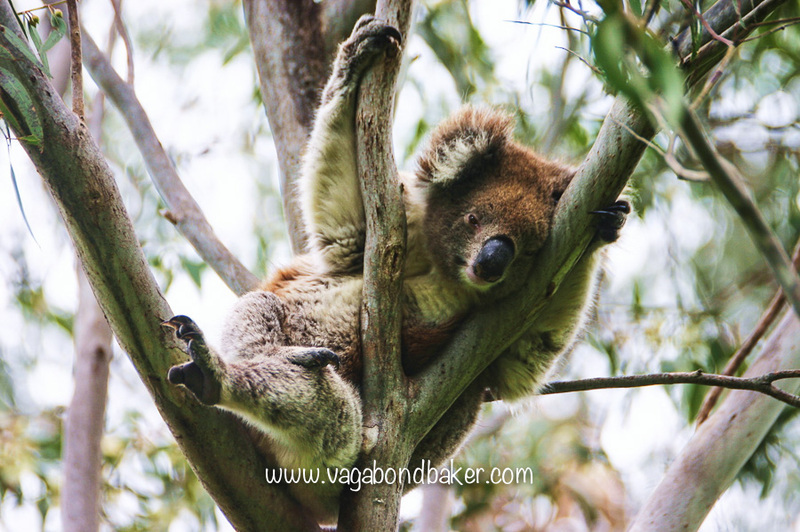 They give an excellent record of Australian fauna including extinct species of mega fauna such as big marsupial lions and leaf-eating giant kangaroos. The road trip continued and we headed to Mount Gambia. On the way we stopped for lunch at a lovely wooded glen where there was a nature trail through the wood to a swamp. We were contentedly wandering along the trail, Chris was a little way ahead of me and I meandered behind taking it all in. In the shelter of a rock, partially hidden by a fringe of grasses, was coiled a large brown snake. A beauty! Suddenly the snake unwound and launched itself seemingly at me, I leapt forward narrowly avoiding the arc of the airborne snake. It happened in seconds, oh boy did I run! Chris tried to calm me – I was so shaken – it was just trying to get away. 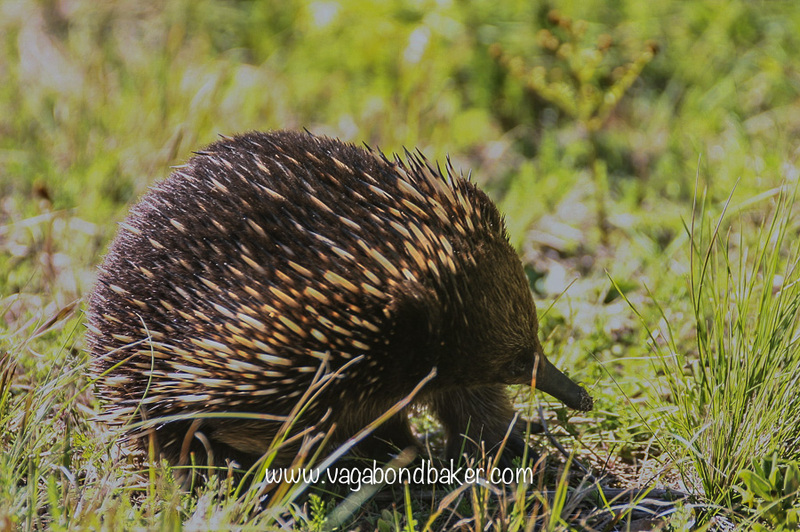 I’d been in Australia too long, I’m become complacent about the potentially deadly wildlife! 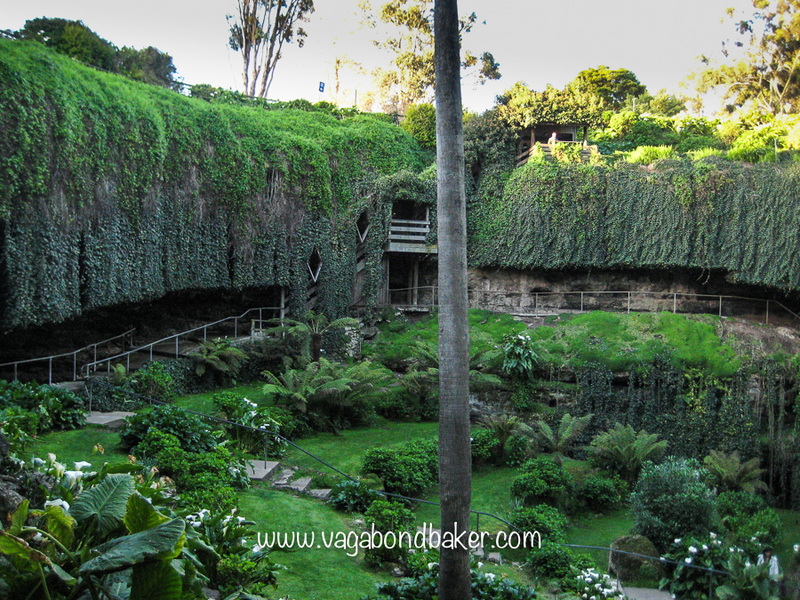 The only thing we did – other than a supermarket shop – in Mount Gambia, where we spent the night, was visit the remarkable Sunken Garden, a Victorian curiosity created from a sink hole. The cylindrical sides were draped with green ivy and there was a pretty garden at the bottom. We stayed until the evening drew in, for one special reason: to see possums! 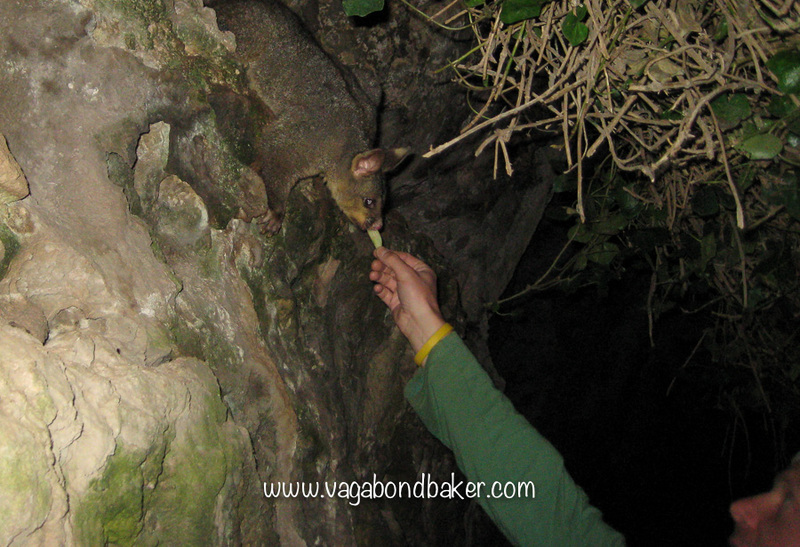 In the darkness (we had torches) the possums appeared out of the rock walls, to beg for treats. We handed them half-moon slices of apple which they grasped with two paws and nibbled in the same way we would eat a slice of melon! The end of the road nearing, the Great Ocean Road would transport us to Melbourne. Chad was already ‘For Sale’ on Gumtree: it was with a heavy heart that we set off on the last stretch. 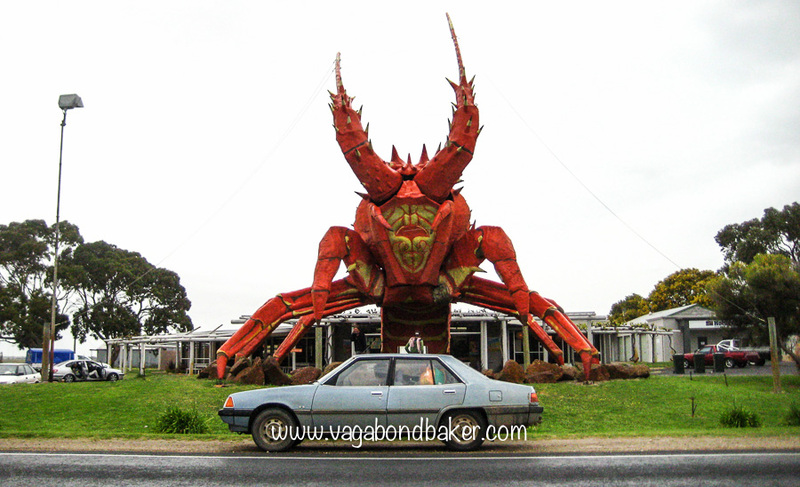 I think this may be the main reason why the Great Ocean Road didn’t wow me. 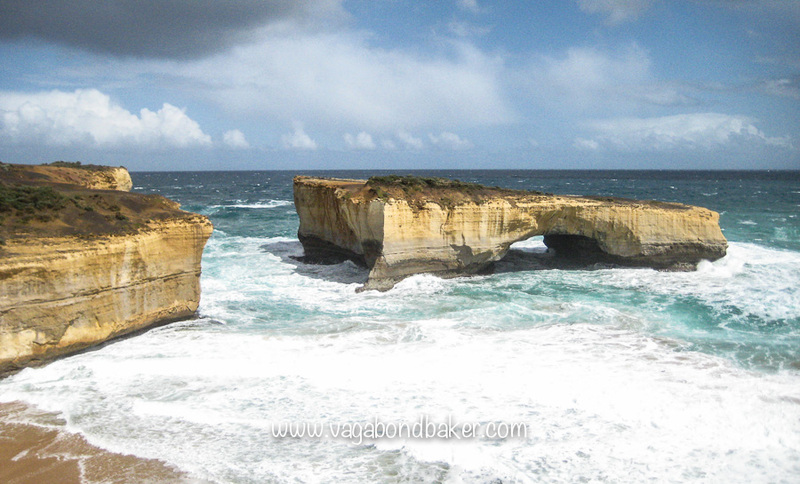 Controversial I know, but after some of the extraordinary sights we’d seen on this epic road trip the Great Ocean Road just didn’t quite excite me as much as I though it would, and I was sad that the journey was ending. We began at Cape Nelson where we saw our first (alive) echidna snuffling along the side of the road, thoroughly pleased with ourselves for this sighting we drove out to the (none active) blow-holes at Cape Bridgewater, where there is also a ‘petrified forest’ of what looked with tree trunks turned to stone but what were actually limestone tubes. 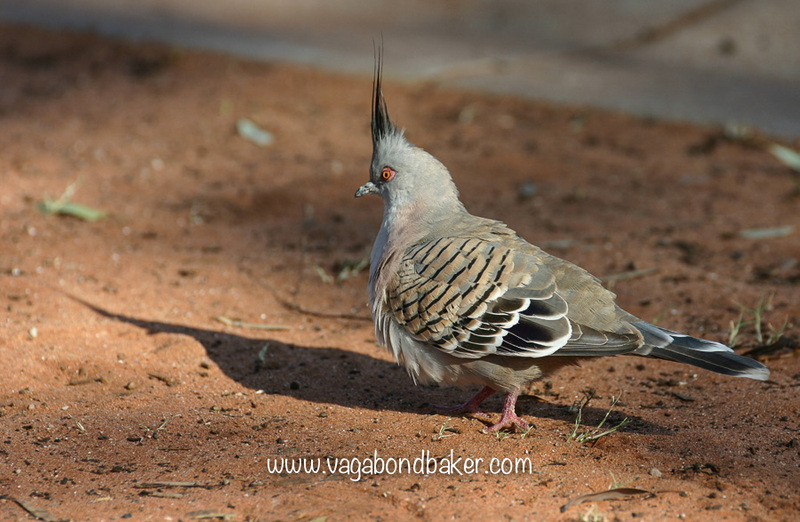 At Tyrendarra we stayed overnight at a cheap bush camp, at the mouth of the Fitzroy river. 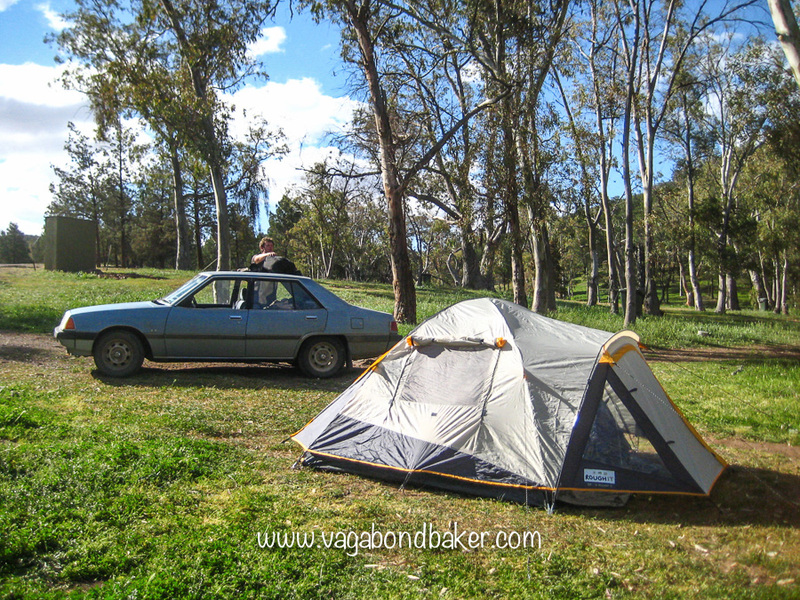 It had rained overnight and the tent was soaked next morning, that’s something I wouldn’t miss: packing up a wet tent. 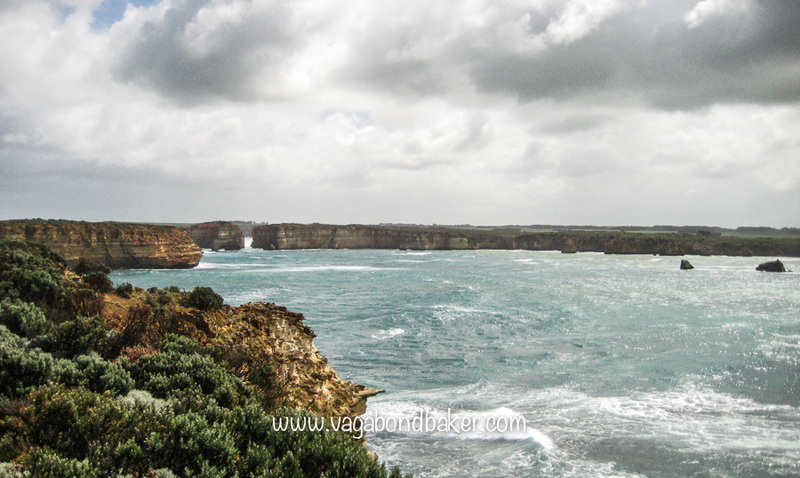 While it didn’t thrill me, the Great Ocean Road is incredibly scenic and we stopped at all the viewpoints. From the comfort of Chad we watched the dramatic sky moving fast with the inclement weather: deep grey, white then blue. It was windy, whipping the sea up. The ‘islands’ were just outcrops, jutting out of the ocean. We left the car and took the short trail down to the lookout, while the wind tried its very best to blow us into the water! It was difficult to even hold the camera straight. Next stop was ‘The Grotto’. A tall winding flight of wooden steps led down from the road to a pretty mirror-like pool crowned with a limestone arch. All I could think was that Agatha Christie would have been very inspired here! Oh, I’ve read too much Poirot and Marple on this round the world trip! ‘London Bridge’ a little further along had a real story attached to it, this sea arch used to be a double arch that was connected to the coast. About fifteen years ago the near arch collapsed into the sea, stranding a couple on the outer arch. The rescue helicopter arrived along with, of course, the media. The couple were saved! Yet as soon as their feet touched the mainland they fled! They’d been having an extramarital affair, and they’d been caught by mother nature playing her wicked game! 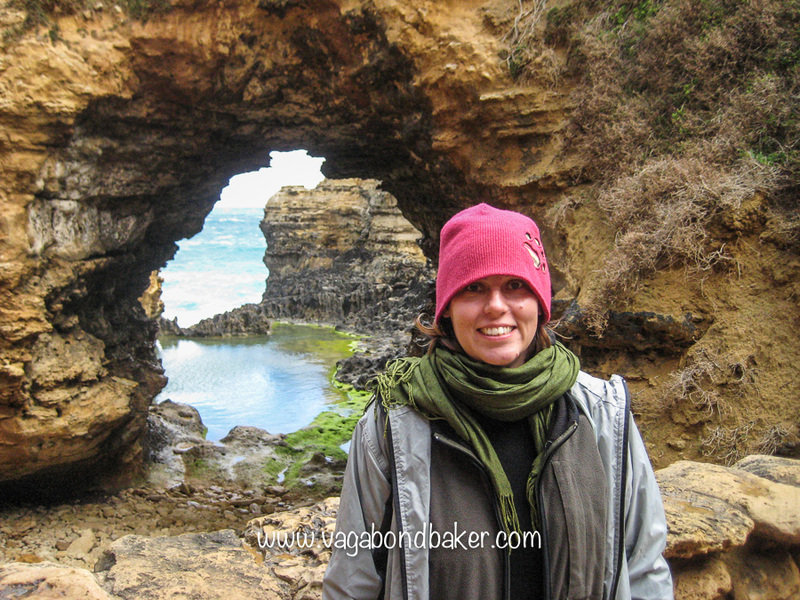 At Loch Ard Gorge we took a walking trail up to an old cemetery. A ship carrying pioneers had sunk in the gorge after a three month voyage from England, only two teenage passengers had survived; the gorge was named after the ship. The dead were buried overlooking the gorge alongside a memorial. 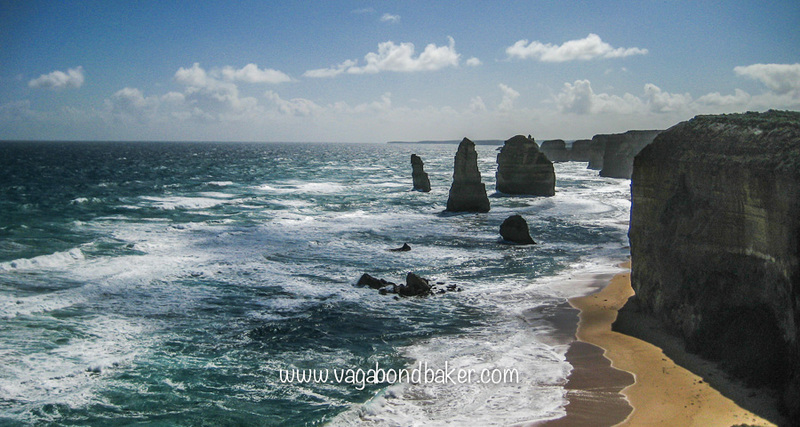 We soon found ourselves approaching ‘The Twelve Apostles’; the walkways were heaving with tourists and although it really is a spectacular view this crowding somewhat detracted from it. I found myself missing the empty vistas of the west. The Twelve Apostles are being eroded by the ocean, to the degree that there are only nine now, the other three have fallen into the sea. That evening we turned off the Great Ocean Road and headed up into the hills, into the forest. We took the Turton Track: a narrow and very winding gravel road through some amazing rainforest with giant ferns. It had been raining yet off the coast the weather was warm and the forest was streaming. We set up camp near Lake Elizabeth in a damp wooded glen before taking a stroll to the lake. The water was mirror still and the scene was very serene and beautiful. Trees appeared to grow out of the lake: it had been created by a landslide fifty years ago, submerging some of the forest. 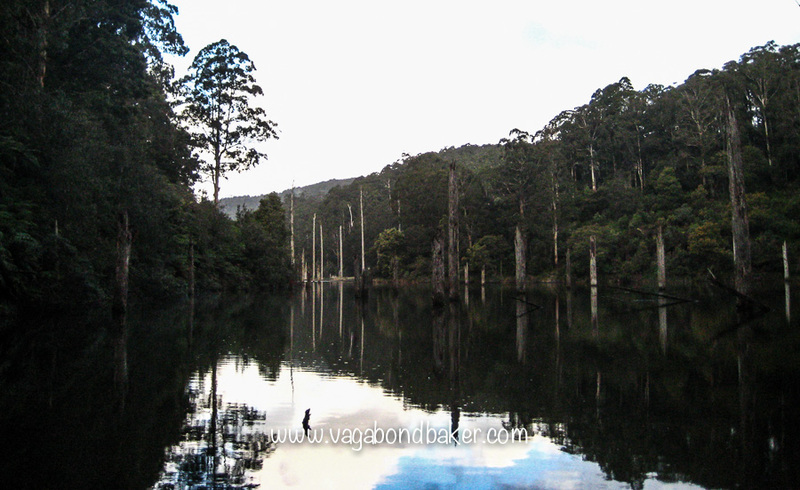 We had been drawn to Lake Elizabeth in the hope of seeing one of it’s magical residents: the platypus but we weren’t to be lucky and despite patiently waiting a sight of one eluded us. Rain, depressing rain, greeted us again the following morning, did it know this was the last 150 kilometres of our road adventure? 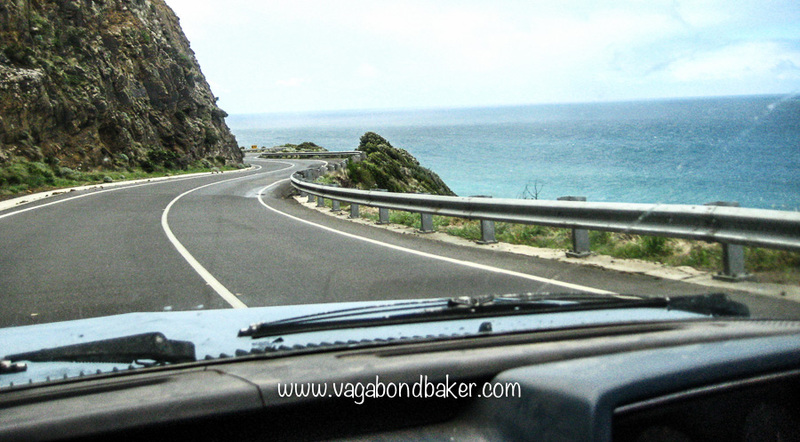 We rejoined the Great Ocean Road and from Apollo Bay the road clung to the coastline, like something from a road movie. Sandwiches were eaten in the car overlooking Bells Beach, we watched the surfers. 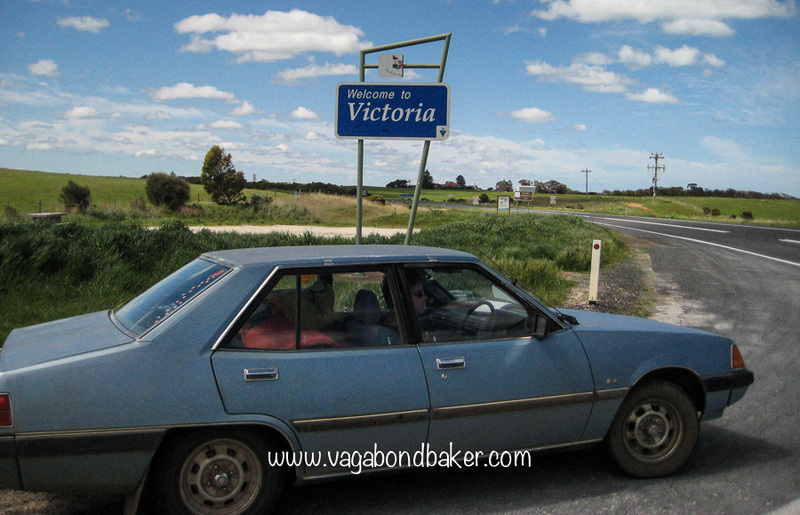 It didn’t take long to reach Geelong, Chad’s tyres ate up the road hungrily and we were in the town limits before we knew it. For one final time we pitched our tent at a caravan and camping park. After giving Chad a thorough clean the next morning before heading into Melbourne to stay with our friend Mel. We sold Chad, for exactly the money we paid for him – AU$800 – to a guy out in Bayswater. Our faithful old friend Chad had driven us over 9000 kilometres without fail, he’d been a legend, I was very sad to say goodbye to him. 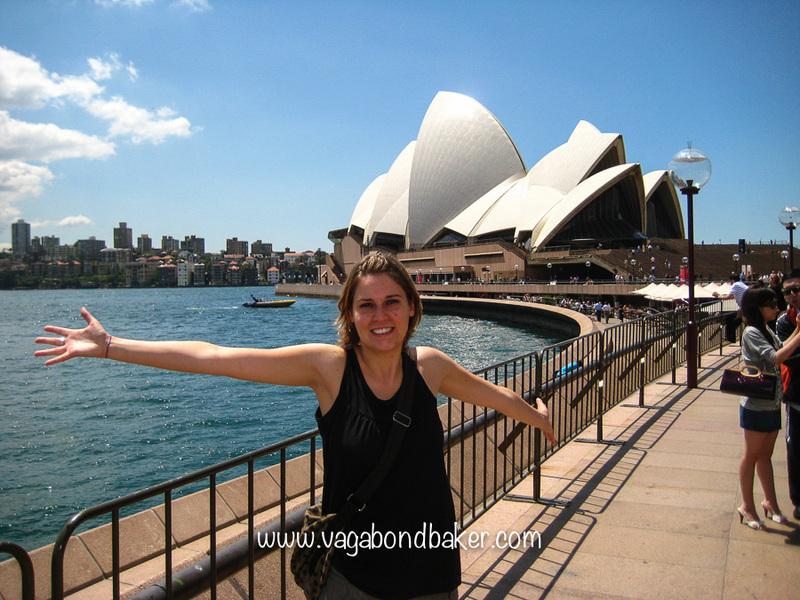 Australia had left an indelible mark on my heart, something which I really hadn’t expected, I still to this day find my mind wandering to Western Australia. It’s the vast open plains, the empty desert, the red earth and deep blue ocean. The star-filled night skies, the open road, the taste of absolute freedom. And our awesome car Chad, of course! 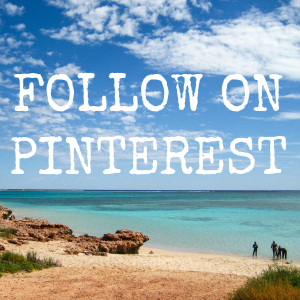 Part 3 Shark Bay Stromatolites: Exmouth to Shark Bay WA ancient stone creatures and feeding wild dolphins! 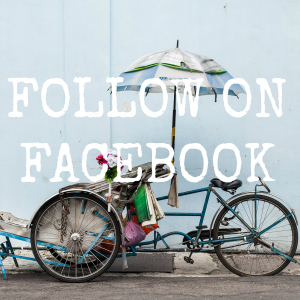 Leave a comment below, I’d love to hear your thoughts! Very nice pictures Rachel Davis. I love road trips, camping, being in the lap of nature. 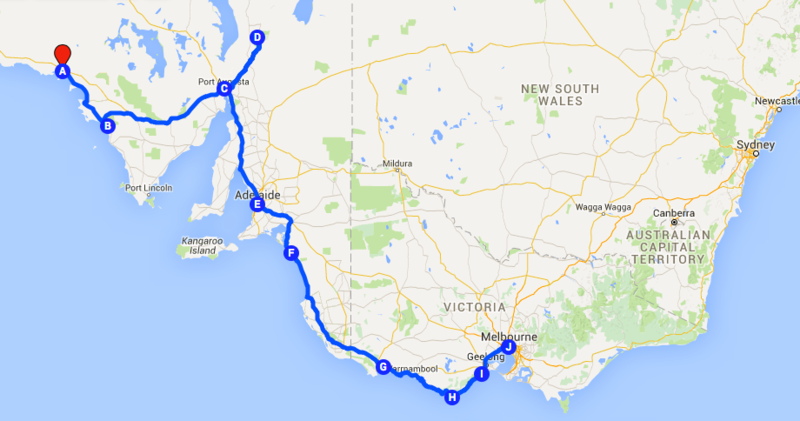 I could very well associate with your experience of this journey from Ceduna to Melbourne. Good post. Thanks so much Anay! 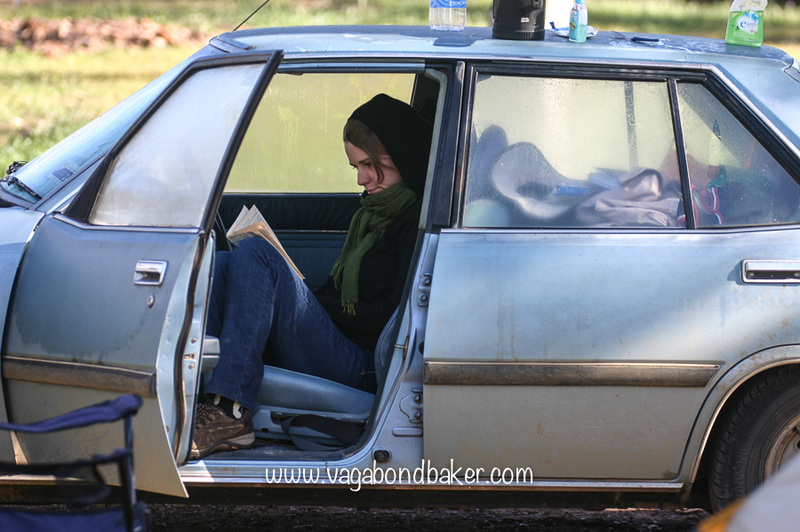 Road trips are my life (as well as long overland rail trips too) and I love just heading out there into nature. I’m really sad to read the last of your Australia postings, they are so beautiful and melancholy with all the years gone by. As usual your descriptions are evocative and moving, and your photos are great. Can’t remember, were you planning to be a travel blogger back then? The detail you captured in your journal is really impressive. Do you know what kind of snake that was? Poisonous? 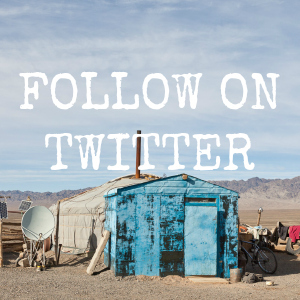 And do you have any desire now to do a long trip where you are camping every night? Aw, thanks Dave! 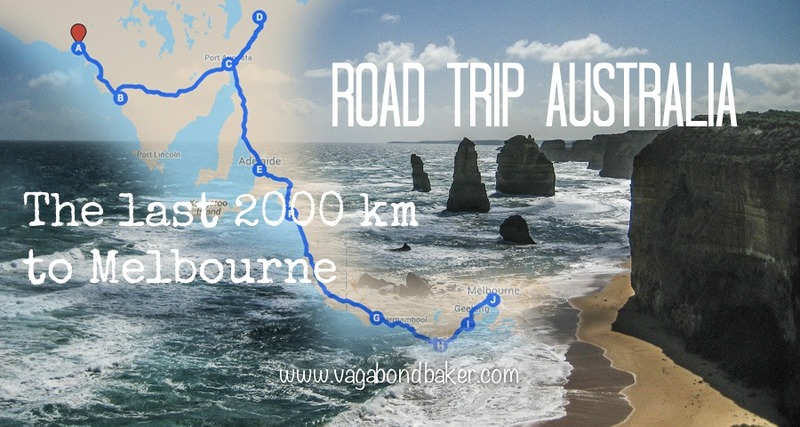 I was a bit sad to write the last one, it brought back the feeling of driving the Great Ocean Road and feeling the same melancholy about the end of the trip. 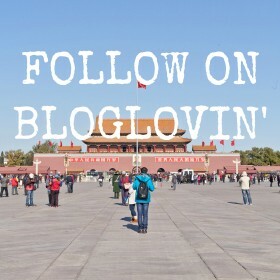 I wasn’t planning to be a blogger then, I had no idea about blogging! I just kept my journal for my own memories, it never occurred to me back then I would be sharing it with the world! I don’t know what type of snake it was, just that it was big and brown, not a great identity. I always have long trip desires but I’d much rather do it in a camper van, the tent became a bit tiresome, especially in bad weather! I have been waiting with bated breath for the last instalment.. thanks Rachel for cheering up my Friday night 🙂 There are a few places I am familiar with, Great Ocean Road of course and the grotto in Mt Gambia. 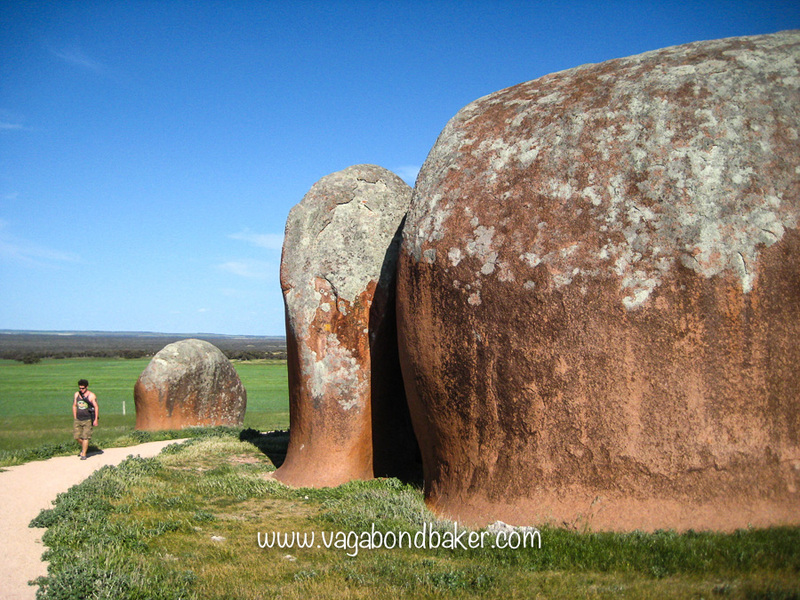 Its been years since I have been to the Barossa, last time we were in South OZ we visited the Claire valley on our way to the Simpson desert. 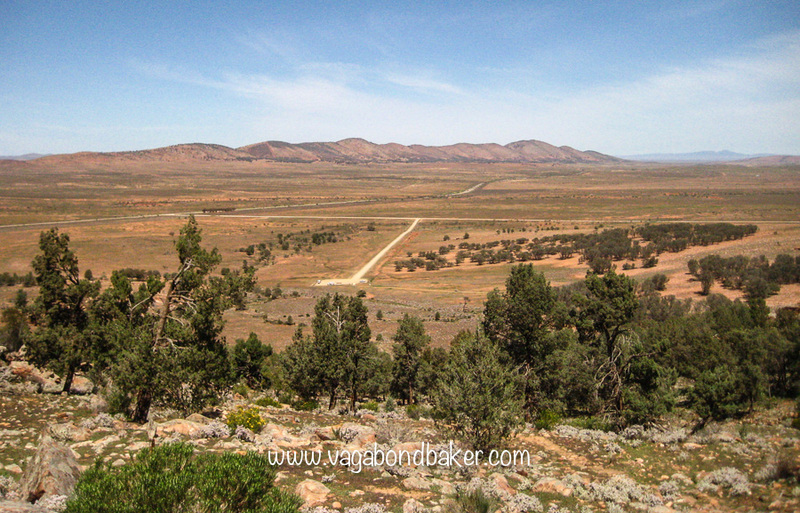 and of course the Flinders ranges was also part of the same trip. The tent collapsing made me laugh, remind’s me of a story of when we lent our small purple tent to a friend years ago who was doing a road trip in WA. Her mates made fun of our little purple tent until one night there was a big wind storm and our little purple tent with Cindy still inside survived where her mates were chasing after their tents!! they had much respect for little purple tent after that night! lol So Chad now lives in Bayswater.. that is 2 suburbs away from where we live so I may have seen him on the highway somewhere!!! 🙂 if he is still alive! Im not sure if Chad is still alive, I do kind of doubt it. I’d love to know, keep your eyes peeled! He’d have a different rego number now of course, for Victoria. He was sold at least once though since Bayswater, so he could be anywhere! How do I know this? From his Facebook group (last added to in 2010). Haha, not just us that got surprised by a storm in a tent then! At the time I was super grumpy, but now it makes a good story I can tell with a smile! I’m sad to end this series, I’ve loved reliving it all! I want to come back and do it all over again! Now where’s that Chad? You still have to do the East coast and Tasmania 🙂 and the red centre! Yes I do! I’d love to come back and road trip the rest of the country! Especially Tazzie!